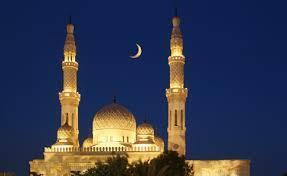 Ramadan is a special month for all Muslims who spend the time remembering those who are less fortunate. During the month every Muslim should practice “saum” – or abstinence – which means they refrain from eating, drinking, smoking, cursing, arguing, lying, fighting and any sexual activity from sunrise to sunset. Fasting is a test of a Muslim’s sincerity to his or her belief and is intended to develop piety or consciousness of Allah. Not all Muslim’s are required to fast. Children below the age of puberty, the sick, the elderly who are too weak and the mentally challenged are exempt from fasting during Ramadan. At the time of breaking ones fast, it is recommended that one do so by eating three dates and drinking water just as Prophet Mohammed (PBUH) prescribed. Once the sun has set, Iftar or the breaking of the fast, begins! After the sunset (maghrib) prayer, the entire family gathers together to enjoy good company and traditional food consisting of harees, fareed, biryarni, soup, dates, fruits and sweets. 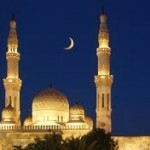 Ramadan comes to an end when the crescent moon has been sighted. Once Ramadan comes to an end, Muslims begin the celebrations of Eid Al Fitr, which is known as the Festival of Breaking the Fast. Article courtesy of Sheikh Mohammed Centre for Cultural Understanding.